It is offered to your attention Internet version of a "hypertext publication of Early Kadambas epigraphy". An occasion for the reference to this inscriptions was the interest of the contents of inscriptions giving a huge volume of the extremely important information about different aspects of history and culture of the early South Indian society. Due to the existing publications (by G.S. Gai, K.V. Ramesh and B.G. Gopal), this databank enables to be based on all (or most part) known information about the epigraphical sources, to use in researches the modern, including the quantitative methods. Completeness of information (naturally, relative) makes present this databank quite useful for wide range of specialists in different fields of Indian history, though it prepared, mainly, as a sample of construction of a "hypertext publication" of Indian epigraphy. The basic purpose of the present database - creation of compact systematic and critical (with variants in deciphering, except for the obvious mistakes) model of publication of all known epigraphical sources, which would be accessible to the user having the minimal experience of work on the computer, not requiring special software. It is necessary for viewing our base, only, the installation of our font: Shri3 (download in zip). For those who have problems in our font installation we prepare variant in .pdf format which can be send by request (mail to: indepigr@yandex.ru). The long research of Indian epigraphy has resulted us in necessity of creation just such databases. The inscriptions, among other sources on a history and culture of India, occupy especially important place. 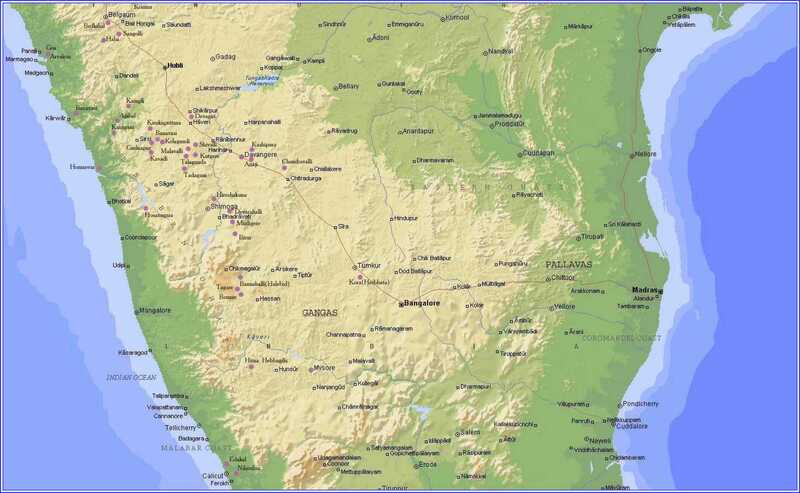 Different periods of history of the country, separate regions of India in the certain chronological periods are restored extremely under the information from epigraphical sources and archaeology. But the part from this huge amount of sources is not published yet. And, what is the most essential, the work of researcher with epigraphy is strongly complicated because these publications dispersed between the several all-Indian and regional journals, central and local special publications, part of which is a bibliographic rarity today. Down to the present time, the sets of new findings are published in regional publishing houses, by regional epigraphical organisations and museums and not are always accessible. This situation does not rescue by reprinting of the most known publications. Only electronic form, in our opinion, not only enables to collect in the common form and to systematise all complex of epigraphy, to ensure a wide circle of the researcher with the complete and versatile information, but also opens a way to use modern methods of research. One of the basic purposes of creation present database is invitation to wide co-operation in this area (not so in e-publication but in transalation, research, preparation the publications). In the systematisation of inscriptions we were guided by one basic principle - by names of kings. 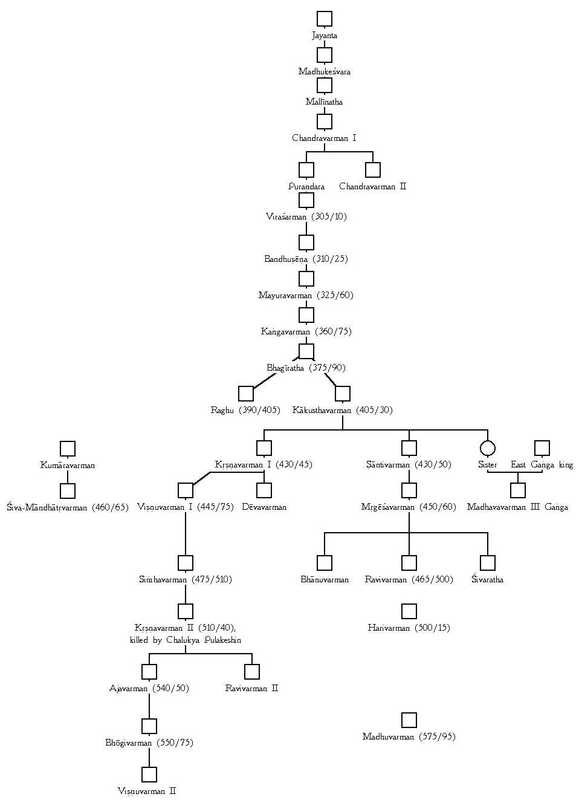 In their genealogy we used the scheme included in G.S.Gai publication (see genealogy and chronology of Kadamba kings in table). Starting from list of kings (if your browser supported frames - here, if not - here), you can easy find the needed text. Before the text of inscription placed brief information about the text and its publications, then you can find five buttons. "Translation" linked to russian translation of inscription, map - to the map, where marked the findplaces of inscriptions by red circles, commentaries and variants , where you can find all variants of readings (here different opinions of researchers can be supplied at any time in the future) and buttons for Indexes of personal and geographical names (which we plane to use, as the common for different collections). In the left corner of every page with the text of inscription you can find two buttons in the form of arrow (linked to the next or previous text of inscription), button "main page" (where you can find abbreviations used in publication, links to our papers in russian and in english, and table of genealogy and chronology of Early Kadambas) and "index" - linked to the list of this king inscriptions. The given base does not include the images of inscriptions for several reasons. The preparation and publication of the set of qualitative images, which could be used in decipherment, is the special work. Such work is important, but more reasonable its publication on CD-ROM. This publication of "hypertext databank" only the second our experience in the electronical critical publication of Indian epigraphy. In this connection we are ready to take into account all recommendations, remarks and wishes of the users. Besides we continue to work in the field of a computerisation Indian epigraphy and are ready to various forms of co-operation in this area with all interested organisations and persons, especially in discussions about the interpretation of inscriptions. All responses and offers send directly to author of this publication - Lielukhine D.N. (indepigr@yandex.ru). Unfortunately, but I cannot yet test the publication on old Mac system and cannot guarantee other functions (on my computer - simple search, printing etc. - are normal).